One of the most interesting squares in the city of Naples is Piazza San Domenico Maggiore [#11 on this map]. The square is on "Spaccanapoli" (named via Benedetto Croce at this particular section of its considerable length) the street that "splits" the historic center of Naples and one of the three main east-west streets of the original Greek city of Neapolis. 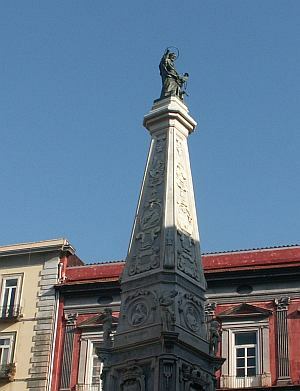 In the center of the square is an obelisk (photo, right) topped by a statue of San Domenico di Guzman, founder of the Dominican Order, erected after the plague of 1656. The original designer of the spire was the great Neapolitan architect, Cosimo Fanzago, among whose other works is the San Martino monastery on the hill overlooking the city. Actual construction (by Francesco Antonio Picchiati) on the spire was started immediately after the plague epidemic of 1656 but was suspended in 1680 when the spire had reached about half the height one sees today. It was finished in 1737 under Charles III, the first Bourbon monarch of Naples. The architect who finished the work was Domenico Antonio Vaccaro. The column is one of the three so-called "plague columns" of Naples—also called votive spires. They were all put up after the plague of 1656 as votive offerings. The other two are the one at Piazza Gesu Nuovo and the Guglia di San Gennaro. The square and spire are actually at the rear of the church (the south side) and not the main entrance. The building is one of those in Naples said to be haunted! In 1590, prince Carlo Gesualdo, famous composer of madrigals, lived in that building and there he killed his wife, Maria d’Avalos, and her young lover, don Fabrizio Carafa. They say that Gesualdo then killed his own tiny son because of a resemblance, real or imagined, to his wife's lover. (Note "they say"--it's a rumor. Please see this footnote to the Gesualdo entry.) After the murders, Gesualdo went on to compose some of the most beautiful and innovative pieces in the madrigal repertoire. He married a second time and died in Naples in 1613. Tradition says that the ghost of his murdered wife still walks the halls of the building. The famous chapel of Sansevero is off the square in back of the Palazzo, itself, and is more properly named the Chapel of Santa Maria della Pietà, or Pietatella. It dates back to 1590 when the Sansevero family had a private chapel built in what were then the gardens of the nearby family residence, the Palazzo Sansevero. Definitive form was given to the chapel by Raimondo di Sangro, famous Prince of Sansevero, whose patronage added the frescoes and sculpture, which would turn the chapel into a harmonious and integral manifestation of religious faith of the eighteenth century. Unique and world famous, of course, is the statue of the Veiled Christ (photo on left), sculpted by Giuseppe Sanmartino in 1753. The Palazzo Sangro di Sansevero is flanked by Palazzo Saluzzo di Corigliano (photo on right, red building on left), the building on the corner of Spaccanapoli. Palazzo Corigliano got its name in the 1700s from its most famous tenant, Duke Augustino di Corigliano, but is much older than that. 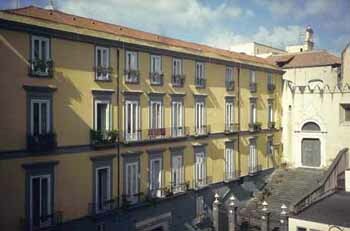 Construction started on Palazzo Corigliano in 1506,at the very beginning of the Spanish viceroyship in Naples. Sources from the 1600s and 1700s refer to it as one of the first truly modern buildings in the city. Originally, the building had two stories, but a third was added in the 1700s by the owner, Agostino Saluzzo. Almost all of the sculpture and decorative murals within Palazzo Corigliano stem from the 1730s. Spectacular and representative as they are of the period, they are considered virtually in a class by themselves in Naples. Quite recently, after extensive renovation, Palazzo Coriglno has served to house some departments of the Orientale University of Naples.